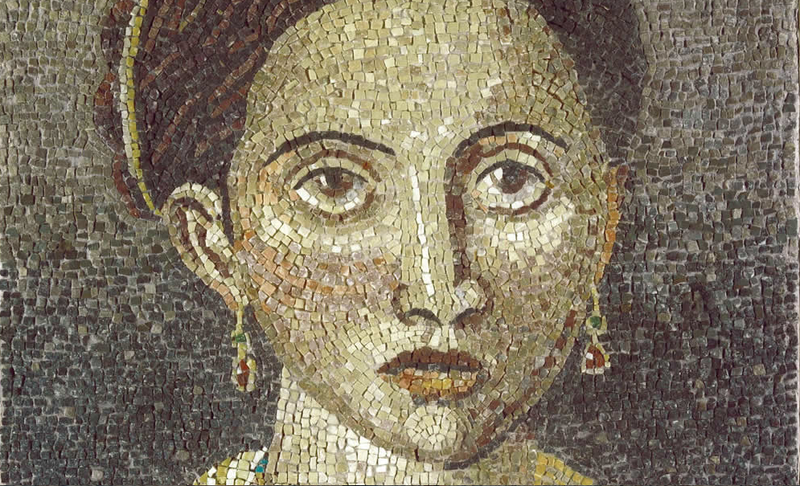 The oldest mosaic technique is the cut technique.It precisely consists of cutting the mosaic material (natural marble stones, smalti ,tiles,enamels) with help of a special mosaic hammer (martellina) and of hardie fixed to a wooden log.The material is hit and split into small pieces ,thus obtaining,so to speak,the “the mosaic basic unit of measurement” or the “Tessera”. The difficulty of this procedure varies according to the quality of the material to be cut.As far as natural stones are concerned, it is necessary to follow their physical structure , in order to orientate the cut in the right manner.Glass mosaic, Smalti and Enamels , instead, have a basic glass composition and their split is generally more complex because it is more difficult to control the direction of the cut.In order to get a clean and linear cut,the “Tessera” must be held firmly and a single hard stroke must hit the surface.Often,in fact,and in the case of enamels,the cut may result in an irregular detachment. : Under this method Enzo Aiello places tesserae, directly into a bed made of a permanent binder of cement or other adhesive.Enzo sets stones at different inclination in order to reflect the light.As you can understand this method can be performed only at the installation place while the others can be done at the studio, also thie metodi s definitive. 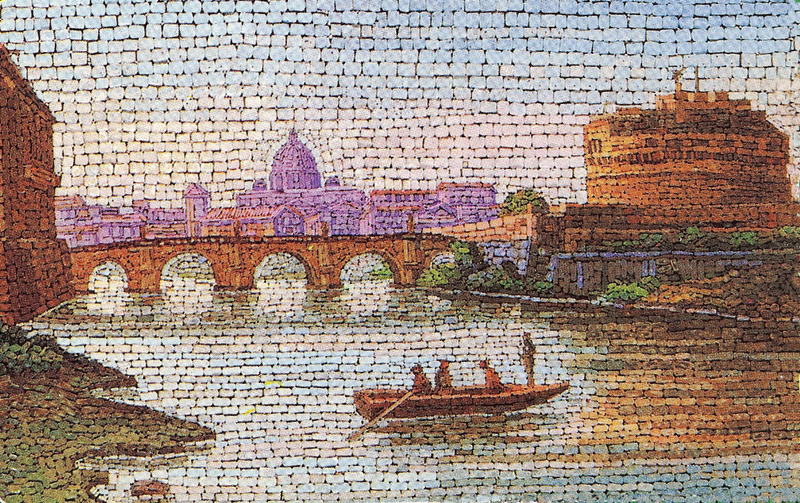 This is a technique in which Enzo glues the TESSERAE face down with a water- soluble glue on sections of paper that he prepares in advance by cutting up an actual size drawing of the mosaic’s composition.When the glue has dried ,the sections can be installed in the site they were planned for. All types of floor mosaic monochrome and polychrome marble,geometric or figurative, made with TESSERAE, cubes of stone or marble of fairly corse size,up to 2 cm. varyingangles with the goal of reflecting light. 4)MICROMOSAIC OPUS VERMICULATUM :Technique of the most refined mosaics (emblemata).the term vermiculatum ,from the Latin vermiculus , little worm,refers either to the tiny ,worm-like tesserae up to 4 mm, no longer in square but irregular in shape,or to the wriggling following of shapes by flow-ing lines of small tesserae. In 1700, a Roman chemist Alessio Matteoli discovered how to make opaque glass in hundreds of different colors, his new development was encouraged , supported and protected by Reverenda Fabbrica di San Pietro,in Vatican.Matteoli discoveries are so jealously guarded by the Vatican that even today very few people are party to the secrets.It goes without that Matteoli’s dicoveries are exceptional;it’s enough to realize that this same opaque glass created by him, when exposed to heat,transforms itself into a malleabile substance and is easily drawn out into a thread.This allowed the creation og long thin rods less than a millimeter in dimension.Thus Giacomo Raffaelli, one of the greatest painters in mosaic , invented in 1770 the technique of micromosaic in smalti filati,glass threads.Raffaelli comes from a family of vitreous enamels manufacturers who supplied the Reverenda Fabbrica di San Pietro.He was the first to espose his works to public in 1775 .Others famous micromosaic artists are Cesare Aguatti and Michelangelo Barberi.With the technique of spun mosaic the tesserae are not made with the mosaic hammer and the hardie but with vitreous enamels and exploits their characteristic of liquefying at high temperatures. Glass tiles are placed in a pot under a powerful flame about 900 C°.The enamel becomes viscous and sticky and can be detached from the pot and attached to a metal rod.The heated enamel material is mixed and melted with another metal rod.Then the incandescent glass is molded to the desired form and then pulled with tweezers,to obtain a thin rod. These rods can be 30 inches long and their thickness can be less than one millimeter.After they dry the micro mosaic artist incises them with a sharp file and chips them with tweezers.and can insert these becomed tesserae in the glazing putty. 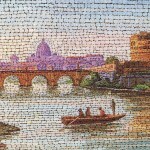 This filament mosaic technique enables the production of micromosaics.In fact the more one lengthens the melted enamel material, the smaller the rod’s section becomes.This method allows the execution of microscopic tesserae and the production of incredibly minute mosaics. Marble tile is one of the most traditional and oldest tesserae. Pebbles, rocks and beach pebbles provide and excellent option for outdoor tesserae as they are durable and hard-wearing. The natural colors that are found blend perfectly with garden based mosaics and are fantastic for creating mosaic garden stepping stones. i just want to tell you that i have found this site very useful for my work. The information you provide are very detailed and allow me to understand how important is the quality of the cutting , each stome must be cut very well in order to create the best mosaic. Would you be interested to display your art at our college?